Practical software architecture and development insights. SharePoint 2013 provides a robust Representational State Transfer (REST) interface that allows any technology that supports standard REST capabilities to interact with SharePoint (sites, libraries, lists, etc). In addition to the built-in SharePoint REST API, you can create your own custom Windows Communication Foundation (WCF) REST services that are hosted in SharePoint. 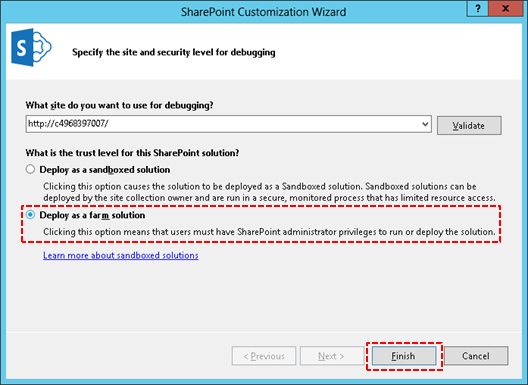 In this example, we'll explore the steps necessary to create a SharePoint-hosted WCF service with a REST interface that is deployed in a SharePoint solution (.wsp). 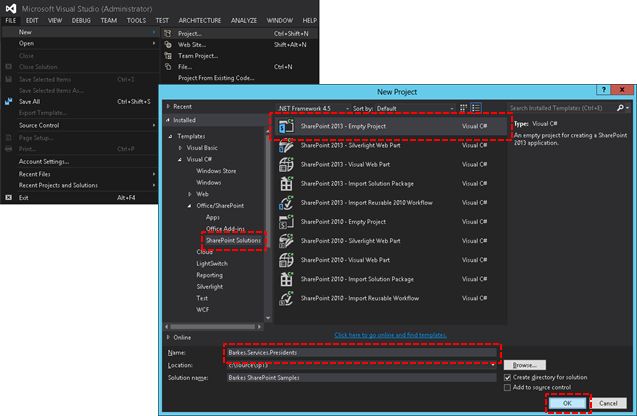 Run Visual Studio 2013 as an Administrator. 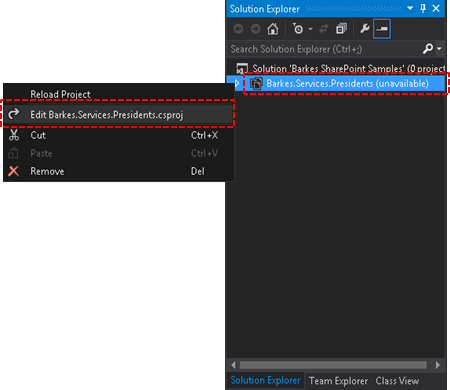 Create a new project named Barkes.Services.Presidents using the SharePoint 2013 - Empty Project template from the Visual C# SharePoint Solutions category. Ensure the Deploy as farm solution option is selected. 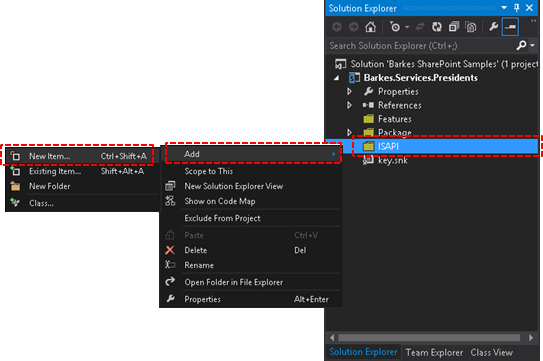 After the project is created, right-click on the project in the Solution Explorer, then Add -> SharePoint Mapped Folder. 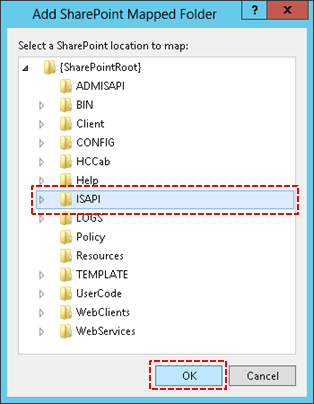 On the Add SharePoint Mapped Folder dialog, select the ISAPI folder and click OK.
Right-click on the ISAPI folder in the Solution Explorer, then Add -> New Item. On the Add New Item dialog, select Text File from the General category and enter PresidentsService.svc as the name, then click Add. 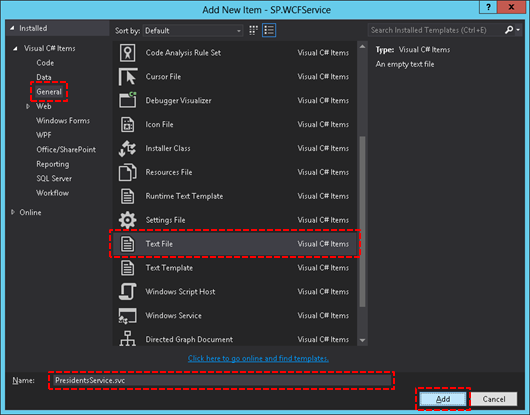 Make sure to change the default file extension from txt to svc. 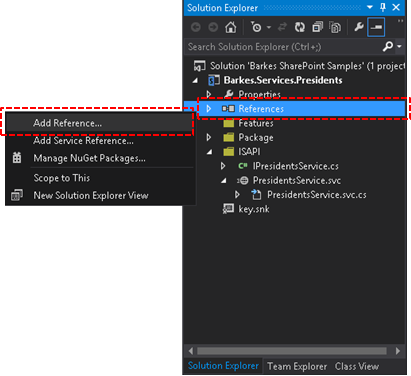 On the Add New Item dialog, select Code File from the Code category and enter PresidentsService.svc.cs as the name, then click Add. 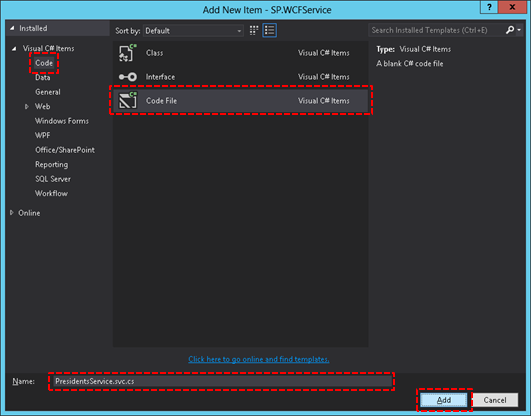 On the Add New Item dialog, select Interface from the Code category and enter IPresidentsService.cs as the name, then click Add. Add the required assembly references by right-clicking References, then Add Reference from the Solution Explorer. 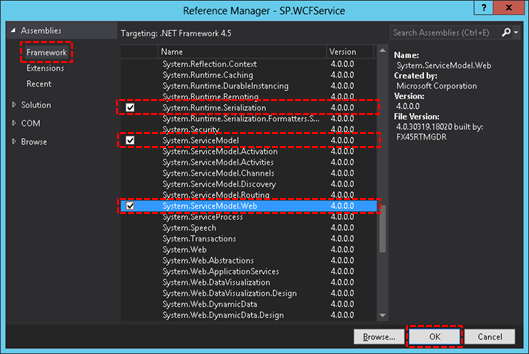 On the Reference Manager dialog, select Framework and check System.Runtime.Serialization, System.ServiceModel and System.ServiceModel.Web, then click OK.
By default Visual Studio does not support token replacements in .SVC files. In order to use the $SharePoint.Project.AssemblyFullName$ token, right-click on the project in Solution Explorer, then Unload Project. If you are prompted to save the project, select yes. 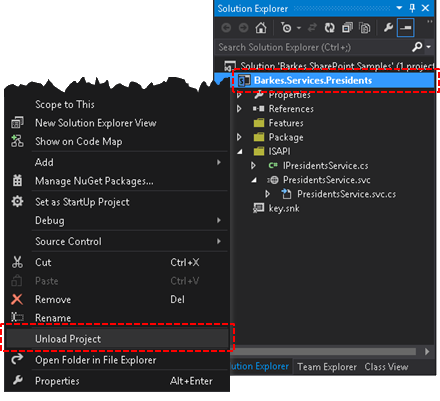 Right-click the project in the Solution Explorer, then Edit Barkes.Services.Presidents.csproj. In the first PropertyGroup (toward the top of the project file), add the TokenReplacementFileExtensions element beneath the SandboxedSolution element and set its value to svc. Don't forget to save the changes to the project file. After you've made the required manual project changes, right-click the project and select Reload Project. Open PresidentsService.svc and enter the following service declaration. 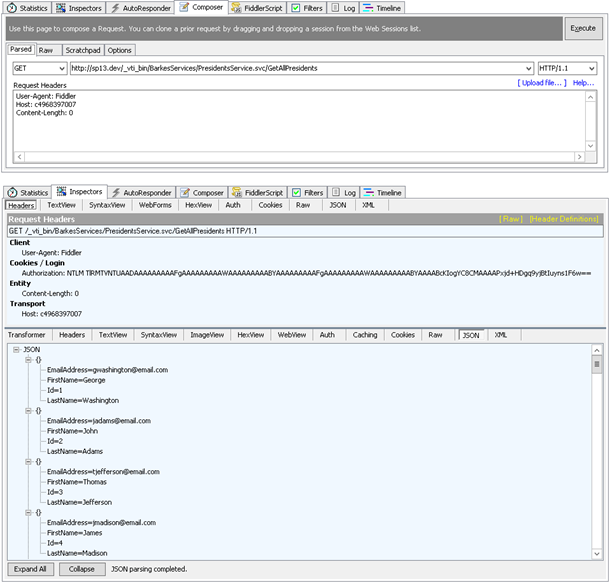 Note that the use of the SharePoint-specific MultipleBaseAddressWebServiceHostFactory replaces the need to specify endpoint configurations in a web.config. 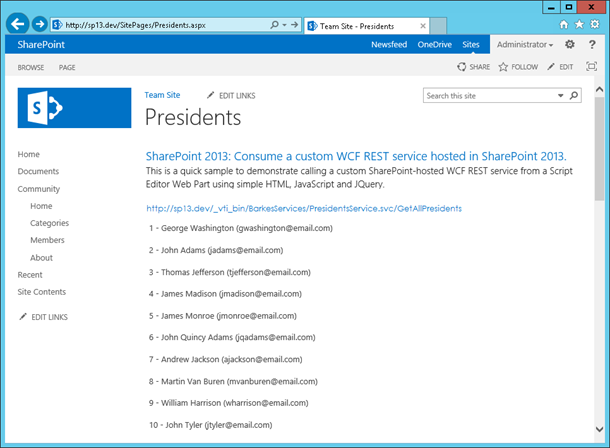 Open IPresidentsService.cs and enter the following interface definition, with associated ServiceContract and OperationContracts. Open PresidentsService.svc.cs and enter the following code to implement the service interface. 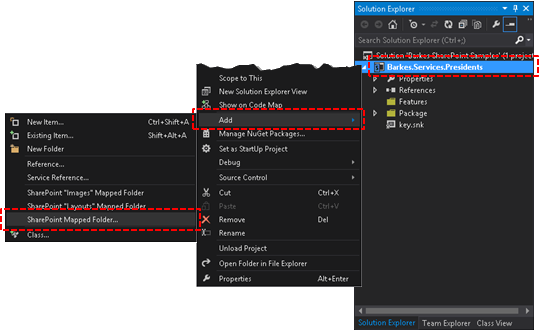 Add a new folder named Model to the project by right-clicking on the project and selecting Add, then New Folder. Add a new class in the Model folder named President.cs and enter the following class definition, with associated DataContract and DataMembers. Add a new class in the Model folder named PresidentsData.cs and enter the following sample data code. In a production application, this would typically come from a database. The presidents array is purposely abbreviated for readability - all the presidents are in the complete source. // This array is purposely abbreviated for readability in this article. // The complete list of presidents is available in the source download. Now you're ready to build the solution and deploy the WSP. After deployment, you'll find the PresidentsService.svc service declaration in the 15 hive at C:\Program Files\Common Files\microsoft shared\Web Server Extensions\15\ISAPI\BarkesServices. There are a number of different options (tools, libraries, etc) and articles available to help you consume a WCF REST service from managed code. The following is an excerpt from a Visual Studio unit test project that calls the service to return all presidents. The custom JSON helper class used to simplify the object (de)serialization is shown below as well. // Be sure to update the url to point to the Presidents Service in your SP farm. For more SharePoint articles and samples, check out the Software Development Outpost. I agree with the other comments - this is by far the best article I've read about this so far. One minor thing I noted, in case anyone else runs across it, is there's no mention in Step 12 of creating the "BarkesServices" folder under the "ISAPI" folder. For anyone trying this on their own, don't forget to create a sub-folder (with a name you pick) under ISAPI for your web service. I am glad I found this article. Saved me a ton of time! Agree with the others. Thanks for the positive feedback. Several people have reported that the source link was broken. Since Atlassian and BitBucket combined, the repo was set to private. I updated the repo settings and the source link should be working again. Glad the source link is back up! Perfect timing for me. Huge help! This is a great article. I've been searching everywhere for a simple walkthrough like this. This is still the best article I've found on this topic for those of us still on-prem. Thanks! MCSD and MCSA certified software architecture and development consultant currently focused on SharePoint, Azure and Office 365.